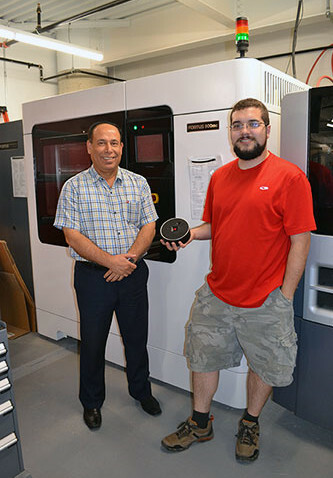 Ryan Vieira, holds up the third version of their audible hockey puck, while standing next to mentor and advisor Amir Alfalahi, in front of the Fortus 900, the machine they used for most of their 3D printing. Sheridan students Ryan Vieira and Kristoffer Pascual are determined to improve the game of blind hockey with their audible hockey puck, despite having little interest in hockey. With a push of a button, their puck produces a loud, constant beep, which visually impaired players can hear and follow as it glides down the rink. “It kind of removes the barriers between people with disabilities and the people who can play the game without any boundaries to them,” said Pascual. According to the duo’s mentor and advisor, Amir Alfalahi, a professor in the Mechanical Engineering program, there are currently three pucks being used to play blind hockey in Canada. The Montreal can, which is a squished juice can, the Toronto wheel, which is a barbecue wheel and the Vancouver puck, which is a can with some in nails inside. The problem with all these pucks is they only make noise when they are moving. If it stops moving or rests against the boards then the players can’t find it and the game comes to a halt until the referee shakes the puck. To design a functional puck, which benefitted the players’ needs, they had a lot to learn about the sport. This included watching a blind hockey game in Markham, interacting with and interviewing the players and incorporating their input after their three prototypes were tested at an arena. “The thing I enjoyed the most was learning about that sporting world and finding out that there is an actual community for the blind hockey association,” said Pascual. According to Alfalahi, visually impaired players were brought to test the pucks by Steve Pollard from Tetra Society of North America, the organization that contacted the professor with the puck idea. Their first version lasted for only 20 minutes before it completely shattered because the material they used was unable to stand the impact force from the players’ sticks. The second puck, which is made of nylon, lasted for about 40 minutes, but it was a little bit heavy and couldn’t handle the impact. The team is hoping the fourth version of the puck they are working on will be accepted by Courage Canada, a blind hockey promotional organization, and will be able to use in an actual game. “I always tell my students, there are many solutions for one problem. We are looking for the perfect solution not the correct solution,” said Alfalahi. The team designed and created everything using the millions of dollars worth of equipment at the Centre for Advanced Manufacturing and Design Technologies at Davis Campus. Their hard work and research lead them to win first place in the best re-engineered products category with their third version at the Innovative Additive Manufacturing 3D Challenge in Boston on Aug. 2. The third-year Mechanical Engineering Design and Drafting students were one of four teams from Sheridan competing in the challenge sponsored by the American Society of Mechanical Engineers. The competition had 20 finalists from universities in the United States, India and Mexico. The winning puck is double the size and height of a standard puck at five and a half inches in diameter and about two inches high, which is normal for blind hockey. 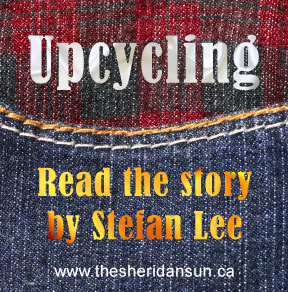 The outer shell is made from aluminum, but the upper and lower part is nylon. On the top is an on/off switch and inside there are two buzzers, which are powered by two nine-volt batteries. The third puck came closest to what the team was trying to create. It lasted about one hour during testing and had little damage except for a crack on the top. Once they find a way to reduce the weight from about one and a half pounds, the team hopes to succeed where many others electronic pucks before theirs have failed. “I think the most important part of this project is the feeling that we are helping some people play hockey again who are disabled, who cannot see well,” said Alfalahi. Added by Elise Morton on September 23, 2015.